The chained slider has always been a useful interface object in iThink and STELLA for allocating 100% of something to different variables within a model. For example, you may want to build a dashboard where someone could play around with allocating funds to various programs within the Obama Administration’s economic stimulus package. In iThink and STELLA version 9.1.2, we decided to improve the behavior of the chained slider in response to feedback we’ve received from customers. We also wanted to nail down the behavior before we added support for it in models published to the web with isee NetSim. Prior to version 9.1.2, the chained slider would allow the user to leave some percentage unallocated. The model author could not easily force 100% allocation. If an amount was left unallocated, it required the author to build model structure to capture the unallocated amount. Also, if the user allocated over 100%, the chained slider would take away the excess over the remaining sliders automatically. This sometimes ended up inadvertently changing the allocations to something the user did not desire. 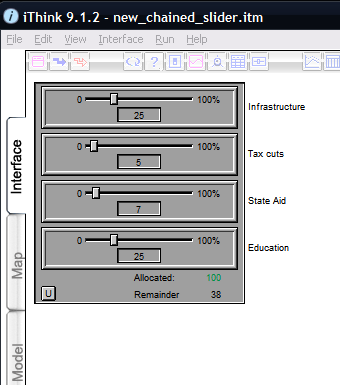 Now in version 9.1.2 the chained slider can force the user to allocate 100% before running. If the total does not equal 100% the slider no longer automatically re-apportions the values. It displays the allocated amount in red if it is not equal to 100% and green if it is. 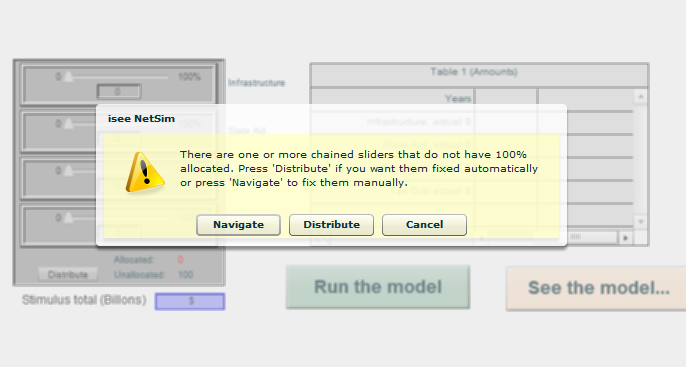 If the chained slider does not have 100% allocated, the user can press a new “Distribute” button to have the slider proportionally distribute the correct amounts. The distribute button is great for those cases where you’re close to the values you want but you can’t quite dial in the exact number. Since the distribute action does so proportionally, it really helps. Additionally, the chained slider now has the option to capture the unallocated amount into a model variable. In this mode, the slider is only invalid if you exceed 100%. The model cannot run if there are any chained sliders that do not add up to exactly 100%. In this event, when the user tries to run the model, they will be informed of this fact and given three options: Distribute the allocation, Navigate to the slider (so they can fix it), and Cancel (the run). We hope these changes will lead to increased use of this useful interface object. All of these changes are available in models published to the web with isee NetSim too!